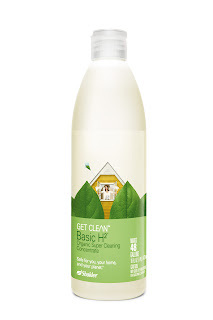 One of my favorite cleaning products is Shaklee's Basic H2. There are many reasons. It is versatile - I can use the same concentrate to create quality window / mirror cleaners, all purpose cleaners and even a degreaser (this is my absolute favorite). This difference is how much of the concentrate is added to 16 ounces of water - a few drops up to 1-1/2 tsp. As I said, my favorite is the degreaser (16 oz water with 1-1/2 tsp Basic H2 concentrate) and I use that on my countertops, appliances, floors (in a pinch it is a great cleaner to spray on the floor and then wipe with a microfiber cloth), showers, sinks, etc. It is definitely my go-to cleaner. The one downside for me is the fact that there is no odor. I don't want a toxic odor - I'm using these products because I want to limit the toxins in our home - but I like to have a fresh clean scent. I add 3-5 drops to my cleaner and give a little shake. My personal favorite is lavender. I do however us tea tree for the bathrooms - it is naturally antiseptic. If you choose to try the tea tree, I would suggest going with 2-3 drops to start because it is quite pungent. How come I didn't do this sooner? Honestly, I didn't really think about it. But now that I have, I can't imagine not incorporating this into my daily life! My cleaning is still 'green' - it's just a bit more personalized now. What's one of your favorite cleaning tips or tricks?